November 29, 2016 Those who think the dedicated conviction of non-violent protectors can be trumped by the application of ever-more damaging force always find that they are either totally vanquished – or left standing in the ruin they have created. The coming weeks are shaping up as a repetition of this everlasting drama of moral suasion versus brutality-at-law. Perhaps politicians will step in with an acknowledgement of where justice lies. Would that there are to be no more outrageous casualties among the warriors whose chief weapon is the urgency of justice. May there be,, at long last, a merciful end of tyranny against indigenous peoples and the rightness of their view of the world. But first the news. The next We Are Seneca Lake trial date is tentatively set for Thursday, December 8th at 9:30 am in Reading Town Court, for Defenders Marie De Mott Grady, Jodi Dean, Josh Dolan, Elisa Evett, Leah Grady-Sayvetz, and Mimi Gridley. However, Defense Attorney Sujata Gibson has requested this be adjourned (postponed) pending outcome of the appeal of an Phil Davis’ conviction Friday, November 18. Mr. Davis was sentenced to ten hours of community service and a $125 NYS surcharge. He was arrested during a peaceful protest outside the gates of the Crestwood gas storage facility in Reading with nine other individuals on December 21, 2014..
Ms. Gibson, an attorney with Schlather, Stumbar, Parks and Salk, stated after the trial that she planned to make an expedited appeal of Davis’ case, and that she believes the verdict was fundamentally wrong. “We are getting inconsistent rulings on these cases and the legal standards being applied appear to be fundamentally flawed. Since we started trying cases in the fall, the majority have resulted in acquittals, Ms. Gibson explained. “But then, in the last few weeks, we’ve been seeing guilty verdicts more often. There is no apparent difference between the evidence presented in the trespass trials that lead to guilt versus the ones that lead to acquittals. “To handle this inconsistency, we elected in this case to test some of the legal issues at play. Rather than have a full trial with evidence and testimony, the Assistant District Attorney and I sat down and hashed out a few pages of “stipulated” facts to present to the Judge. Based on these facts, the Judge delivered a guilty verdict. He declined to give any guidance as to how he came to this decision. Follow The Banner for court information confirmation or rescheduling. Or for up to the minute status, contact Michael Dineen mdineen39@gmail.com. A short symposium of opinions on why progressives have failed to connect with white rural Americans. It is a perplexity many activists consider carefully. Trump supporters are saying this. Progressive pundits are saying this. Talking heads across all forms of the media are saying this. Even some Democratic leaders are saying this. It doesn’t matter how many people say it, it is complete [expletive deleted]. It is an intellectual/linguistic sleight of hand meant to throw attention away from the real problem. The real problem isn’t east coast elites who don’t understand or care about rural America. The real problem is rural America doesn’t understand the causes of their own situations and fears and they have shown no interest in finding out. They don’t want to know why they feel the way they do or why they are struggling because they don’t want to admit it is in large part because of choices they’ve made and horrible things they’ve allowed themselves to believe. …What I understand is that rural, Christian, white Americans are entrenched in fundamentalist belief systems; don’t trust people outside their tribe; have been force-fed a diet of misinformation and lies for decades; are unwilling to understand their own situations; and truly believe whites are superior to all races. No amount of understanding is going to change these things or what they believe. No amount of niceties will get them to be introspective. No economic policy put forth by someone outside their tribe is going to be listened to no matter how beneficial it would be for them. I understand rural, Christian, white America all too well. I understand their fears are based on myths and lies. I understand they feel left behind by a world they don’t understand and don’t really care to. They are willing to vote against their own interest if they can be convinced it will make sure minorities are harmed more. Their Christian beliefs and morals are truly only extended to fellow white Christians. They are the problem with progress and always will be, because their belief systems are constructed against it. 2. Why Do White Working-Class People Vote Against Their Interests? They Don’t. In Strangers in Their Own Land, the renowned sociologist Arlie Hochschild embarks on a thought-provoking journey from her liberal hometown of Berkeley, California, deep into Louisiana bayou country—a stronghold of the conservative right. As she gets to know people who strongly oppose many of the ideas she champions, Hochschild nevertheless finds common ground with the people she meets—among them a Tea Party activist whose town has been swallowed by a sinkhole caused by a drilling accident—people whose concerns are ones that all Americans share: the desire for community, the embrace of family, and hopes for their children. Activists protesting the continued construction of the Dakota Access Pipeline must shut down one of their camps by Dec. 5, the Army Corps of Engineers ordered in a letter sent to the Standing Rock Sioux Tribe’s leader. Citing increased violence between protesters and law enforcement and the increasingly harsh winter conditions, the corps said it decided to close its land to the protesters who have been there since early April. This will shut down the Oceti Sakowin camp, which is one of the three camps located near the construction site. Colonel Henderson, district commander of the Army Corps of Engineers, wrote that he had implored the Standing Rock Sioux Tribal Chairman Dave Archambault II to tell members of his tribe to move from the property north of the Cannonball River. “I am asking you, as a Tribal leader, to encourage members of your Tribe, as well as any non-members who support you who are located in the encampments north of the Cannonball River on Corps’ lands to immediately and peacefully move to the free speech zone south of the Cannonball River or to a more sustainable location for the winter,” he wrote in the letter to the chairman. 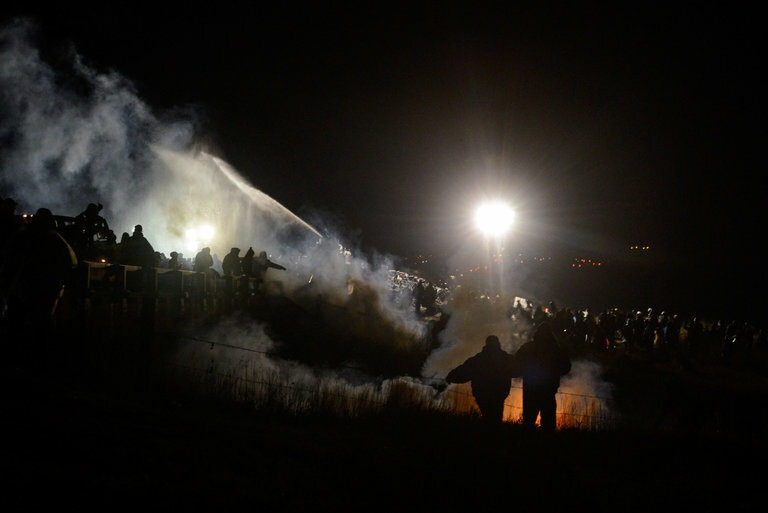 On November 20th the police and National Guard violently attacked peaceful water protectors at Standing Rock. Police used tear gas, rubber bullets, pepper spray, sound grenades, and sprayed them with water cannons in subfreezing conditions, hundreds of people were injured. You can read more about the what happened here. On #NoBlackSnakeFriday, the Obama Administration issued an eviction notice to the Oceti Sakowin encampments at Standing Rock. The eviction notice came as a letter from the US Army Corps of Engineers to the Standing Rock Sioux Tribe, informing them that on Dec. 5th, it will “close” all lands north of the Cannonball River, where the Oceti Sakowin encampment is located. We call on all people of conscience, from all Nations, to join the encampments and stand with us by December 5 as we put our bodies in front of the machines. We call on allies across the world to take action EVERY DAY starting December 1. When injustice aligns with cruelty, and heavy weaponry is involved, the results can be shameful and bloody. Witness what happened on Sunday in North Dakota, when law enforcement officers escalated their tactics against unarmed American Indians and allies who have waged months of protests against the Dakota Access oil pipeline. They drenched protesters with water cannons on a frigid night, with temperatures in the 20s. According to protesters and news accounts, the officers also fired rubber bullets, pepper spray, percussion grenades and tear gas. More than 160 people were reportedly injured, with one protester’s arm damaged so badly she might lose it. 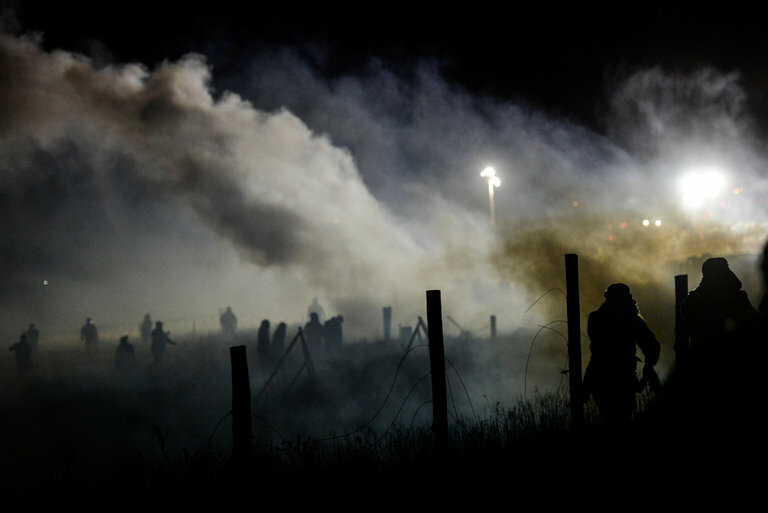 The confrontation happened at Backwater Bridge, on a highway linking the Standing Rock Sioux Reservation and Bismarck, N.D. Burned-out trucks and a police barricade have made the bridge impassable. Protesters say this is a needless threat to public safety — forcing emergency vehicles to detour about 20 miles — as well as a spiteful attempt to keep them away from the pipeline construction site. The violence erupted after some of the protesters tried to remove the truck carcasses on Sunday. “We’re just not going to let people or protesters in large groups come in and threaten officers, that’s not happening,” said the Morton County sheriff, Kyle Kirchmeier. The Sheriff’s Department’s Facebook page linked to a video of the armed and armored officers, the water cannon drenching the crowd, and a rock flying overhead. The pipeline, all but built, is meant to ship crude oil from North Dakota to Illinois. Built almost entirely on private property, the pipeline crosses ancestral lands of the Standing Rock Sioux, passing less than a mile from the tribal reservation. Tribe members fear contamination of their drinking water and damage to sacred sites. They are trying to persuade the federal government to deny permits allowing the pipeline to cross the Missouri River near their reservation. Hundreds of veterans are preparing to join the Water Protectors at the Standing Rock Sioux Reservation in North Dakota early next month to peacefully protest the Dakota Access Pipeline (DAPL). So far, more than $75,000 has been raised toward the $200,000 goal in 11 days. The money raised is “strictly” going towards “transportation and bail money,” Clark Jr. tweeted. On November 8, 2016, Beaska Niillas, chairman of the Norwegian Sámi Association (NSA) walked into a conference room in Oslo, Norway, with his wife, Sara Marielle Gaup Beaska, who had spent time in Standing Rock. Both are members of the Sámi Parliament and Beaska is a member of the Norwegian Society for the Conservation of Nature. Niillas and Beaska flew over 1,000 miles from their home in Finmark, the homelands of the Indigenous Sámi people and the most northern province of Norway located above the Artic circle. Niillas set up a meeting with executives at DNB, Norway’s largest bank, to demand that they withdraw their investment in the Dakota Access pipeline (DAPL). “It is natural that we would try to help Standing Rock. It is easy for Indigenous people around the world to recognize the struggle. We see what they are going through and we feel it. There is no them, only us,” Niillas said in a Skype interview with Truthout. In his hands was a 20-page report documenting the human rights abuses that members of the Standing Rock Sioux tribe and their allies have experienced at the hands of the state of North Dakota and Dakota Access LLC’s private security firm. Thousands have gathered to assist the Standing Rock Sioux tribe in protecting the area from the construction of the $3.7 billion project that would transport crude oil from the Bakken oil field in North Dakota to a refinery to near Chicago. The story of how the Sámi received that report illustrates how international networks of Indigenous people are challenging the power structure behind the oppression of Indigenous people all around the world, Niillas said. DNB, a direct investor and loan provider to the Dakota Access pipeline, loaned $120 million to the Bakken pipeline project and extended $460 million in credit lines to companies with ownership stakes, specifically Energy Transfer Partners, Sunoco Logistics, Phillips 66 and Marathon. 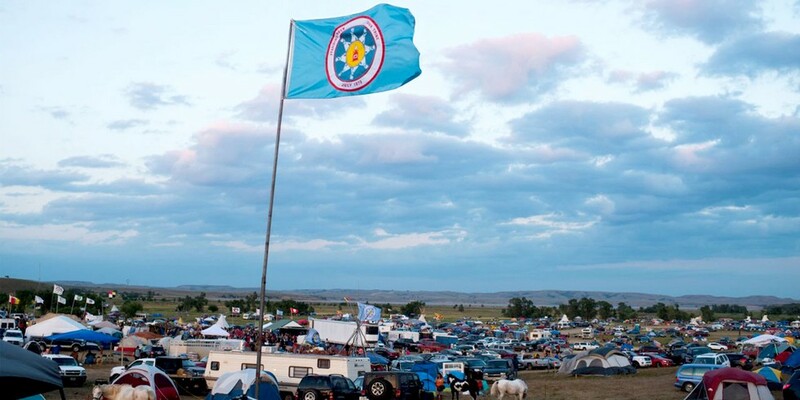 That report came to Niillas unexpectedly from law school graduate Michelle Cook, who had worked at the Standing Rock camp to develop a legal infrastructure to support the tribe and its allies. At Standing Rock and Beyond, What Is to Be Done? Near Cannon Ball, N.D. — “We love you!” yelled someone from our line, linked arm in arm. We were facing Dakota Access Pipeline workers threatening us with baseball bats and wrenches, one of whom had only moments ago sped his large truck through our ranks. They had called us “the scum of the earth,” and replied to our assurance that we were nonviolent by warning, “We’re not.” A helicopter had appeared and begun circling low over our heads. And from this scene, one of the men who had not yet spoken sheepishly replied, “We love you, too. We eventually parted ways, not in peace but at least not in physical violence. We had distracted them from further construction of the project that threatened to spill oil in the Lakota water supply and headed back to our cars to take part in a march through the streets of Bismarck, N.D. But amid all the movement, that moment stayed with me. I had come with a group of Catholic Workers for reasons anyone studying or teaching theology as I do might find obvious. The violation of basic dignity happening here defies the consistent refrain by the prophets and Jesus to do justice with an eye toward the exploited. We had been told white bodies could help by surrounding native ones, shielding them while they sought to protect their water. The anxiety about immigrants’ diluting “American culture” that helped usher Donald J. Trump to victory has caused many Americans to forget that “American culture” itself began as an intrusion from foreign lands; Lakota people at Standing Rock also have a historically well-established reason to fear this culture. The Lakota are reminding those who will listen that this land’s original immigration problem was of European origin and it continues to threaten their lives and livelihood after half a millennium of a genocidal onslaught. Its most recent manifestation is this pipeline. I have meditated on that profession of love several days ago from a grown man wielding a bat to threaten us. It called to mind a conversation with my theology students at Fordham about Henry David Thoreau’s essay “On the Duty of Civil Disobedience,” in which he argues that “all machines have their friction,” but that “when the friction comes to have its machine, and oppression and robbery are organized, I say, let us not have such a machine any longer.” He had in mind the evils of slavery and the American government’s theft of half of Mexico in the Mexican-American War, but it spoke fittingly to this older form of oppression and robbery the Lakota people still suffer, in which even those who love them will still oppose them with a weapon and disrupt their sacred grounds. After our class argued over how we might know when these frictions came to possess the machinery of government, one student declared emphatically that if we could not already recognize that the friction had taken over, then we would never see it. It was hard to disagree, especially the day after our encounter with the pipeline workers when the police pepper sprayed a Lakota prayer service and those of us surrounding it, arresting whom they could. What kind of machine produces violence to meet prayer, and prison in return for demanding resources to simply live? What kind of machine responds to those trying to protect their water by spraying them in subfreezing temperatures with water? Is it a machine overtaken with friction, or is the nexus of power between corporations and government that is trying to trample over the Lakota once again simply an unfortunate byproduct of an otherwise benevolent and worthy machine? How much oppression and theft is tolerable in order to keep the machine running? Where is our breaking point, at which we say that the benefits do not outweigh the human cost? On Tuesday, Michael R. Bloomberg, the media tycoon and former mayor of New York City, said that American cities would continue to enact climate policies no matter what Mr. Trump and the federal government decided to do. Mr. Bloomberg, a longtime advocate for action on climate change, praised Xie Zhenhua, China’s climate envoy, for saying China remained committed to tackling the issue. “That’s a responsible thing to do for the Chinese people and the world,” he said. 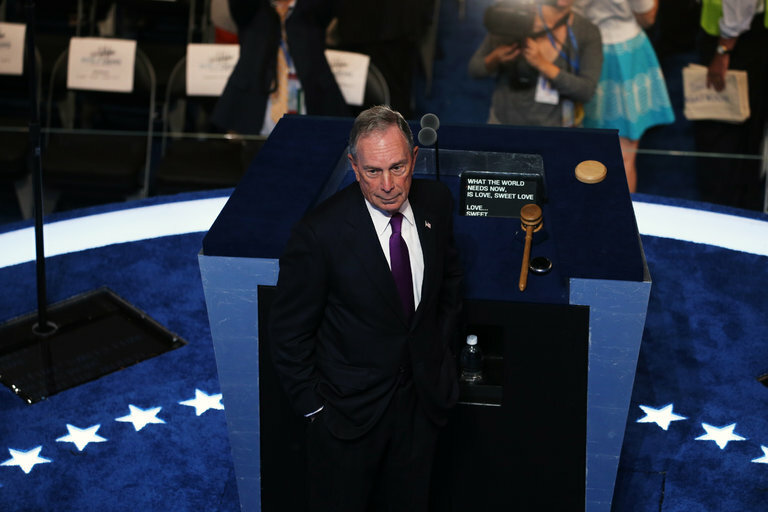 Mr. Bloomberg added that if Mr. Trump decided to withdraw the United States from the Paris Agreement, then he would urge the mayors of 128 cities in the United States who see the need to fight climate change to join the agreement. “I can’t tell you what Donald Trump’s administration will do — and in all fairness, they will need time to figure it out themselves. What’s said on the campaign trail is one thing; actually carrying out a specific policy is another. I hope they’ll recognize the importance of the issue. But I am confident that no matter what happens in Washington, no matter what regulations the next administration adopts or rescinds, no matter what laws the next Congress may pass, we will meet the pledges that the U.S. made in Paris. “The reason is simple: Cities, businesses and citizens will continue reducing emissions, because they have concluded — just as China has — that doing so is in their own self-interest.